Home > Google News > Google SEO > Google Now Offering Google Certified Partners For SEO? A week ago we reported that Google will not offer SEO certification period. But now we see Google has messaging that they do offer certified Google partners that offer SEO. Aaron Wall spotted it and posted the details on Twitter. 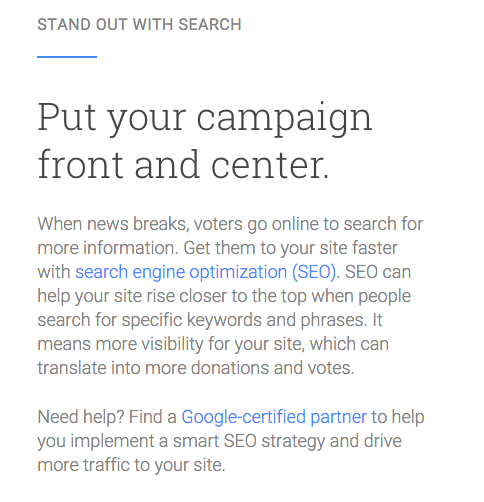 On the Google Elections page, it shows a section for "STAND OUT WITH SEARCH" and in there it says you can find your way by hiring a "Google-certified partner to help you implement a smart SEO strategy and drive more traffic to your site." Of course, you and I know this is just a case of the person who wrote this content on this page knowing nothing about Google's policies on SEO and also clearly not much about Google's certified partners. None of the certification is on SEO, it is on AdWords, Analytics, YouTube, DoubleClick but not on SEO. It is just a shame to see Google keep making mistakes like this.